Upon review of the proposed Board of Trustees policies, we are concerned about draft Policy 6100 “Detecting and Reporting Fraud.” https://www.ncc.edu/aboutncc/ourpeople/board_of_trustees/pdfs/BOT_Policy_SECTION_6100.pdf) Although to our knowledge, this policy has not been placed on a Board committee’s agenda, we would like to offer comments at this time so that our concerns can be considered during committee discussion. SUNY requires “each campus…to establish an easily accessible mechanism (fraud hotline) such as a toll free number, e-mail address, or facsimile number that individuals can use to report…” along with a guarantee of “limited confidentiality.” Policy 6100 does not provide for either. Policy 6100 should affirmatively offer “Whistleblower Protection” as in the SUNY policy. Policy 6100 is confusing and contradictory and places an onerous burden on the reporting employee. Policy 6100 applies a “due care” and “reasonable certainty” standard for reporting. It also contains the contradictory admonition that the employee “…not try to question anyone nor investigate…” while at the same time warning the reporting employee to “…take due care and thought, and make all effort to acquire reasonable certainty prior to reporting.” These requirements are mutually exclusive rendering the Policy’s requirements confusing and vague. Moreover, while the Policy makes reporting an affirmative responsibility with NCC employees subject to disciplinary action for its violation, this reporting standard deviates from SUNY’s “Good Faith “ standard. The SUNY policy “…protects those who make a report, even if that report turns out to be incorrect. If the reporter, given the facts they had at the time, believed that the fraud they were reporting was true, they will be afforded protection from any retaliation.” This is an entirely different standard than the one this policy will apply here at NCC. By Janet Farrell Leontiou, Ph.D. Recently, I attended a film screening at our local public school. The film, “Most Likely to Succeed,” (produced by Ted Dintersmith and One Potato Productions, 2015, and directed by Greg Whiteley.) This is a new entry into a growing genre of films offering critique of American public education. The film establishes, like most, that school is failing our kids. The film is well done and shows that public school, how it is structured now, now longer works. The film demonstrates that public school in America was invented in response to supplying workers to industry. The filmmakers make clear that we are living in the post-industrial age and therefore, our thinking of school needs to evolve into a more relevant institution. Instead of school preparing people for the assembly line, the film argues that school should now serve a high-tech workplace. What if we could best prepare our children for being in the world without looking to business to define education? We keep getting school wrong because we look to business for a definition instead of defining education on its own terms for its own sake. The film critiques a version of public school but then ends up replacing the model with a newer version of the same model. The film features High Tech High in California. The narrative is shaped around two very engaging students: Samantha and Brian. Throughout the film, we see their transformation and we celebrate their successes. The classroom, in High Tech High, can best be described as modeled after a Google lab and the teachers are more like managers than teachers. The structure of the school is loose. There are no designated subjects or class periods. The teachers do not have tenure and their contracts are renewed annually. Although the film suggests that this arrangement is mutually preferred by both teachers and school administrators, it models a corporate strategy of hiring contract workers. All of the teachers in the film are extremely likable; there is tremendous good will toward their students. In one of the first scenes at the school, the teacher instructs the students to assemble the tables and chairs. He then leaves them to figure out how to accomplish the task. Student autonomy does not necessarily translate to hands-on learning. In the film, students are expected to find out what they need when they need it. The Socratic method is called Socratic not only because there is an emphasis on questions but also because it was modeled after Socrates who led the conversation. The film makes clear that we do not know what the workplace will look like in the future and this is the motive behind the creation of a school that emphasizes: collaboration, independent research, creativity, and risk taking. The school year culminates in a showcase of collaborative student work. The work is beautiful and impressive. I am left asking the question: why can’t we create an environment like this but keep a traditional curriculum and see the teacher as the authority–as the one who is the author of the educational encounter. Why can’t we have the socratic seminar with Socrates? I have taught at a community college for the last twenty years. In the classroom, I have worked to create my version of education as many educators have done. The word “education” means to lead out from darkness. I see it as separate from training. Training means to drag; it means we are always following something or someone. On the locomotive train, school is the caboose. I invite my students to engage with the educational process at any point that interests them. I teach to their interests and drop in the pedagogy as I go along. I ask that we all let go of the end product and make a commitment to learning for its own sake. I ask my students to wonder about what kind of work they envision for themselves. I do ask them about jobs. Work comes from the Latin word opus, meaning something grand we produce with our lives. I tell them that they need not have the answer, only to ask the question. Getting them to ask questions is extremely difficult because they have little practice. What they most need to learn is to learn how to learn. The film makes clear what I think we all know by now but we are stuck with a system that is very difficult to change. The test driven, meaningless culture of school is replicating a rat race mentality to school. We are all running on the gerbil wheel and in some cases, arguing that we cannot step off the wheel. Parents at the screening of the film in my community were anxious. We have been trained to think that school is the ticket to our kids’ financial success. Now, this genre of films suggests that the deal we have struck may not pan out as we imagined. I would like to see school disengage from business and define itself on its own terms. We have stripped meaning out of school. Don’t aim at success–the more you aim at it and make it a target, the more you are going to miss it. For success like happiness, cannot be pursued; it must ensue, and it does so as the unintended side-effect of one’s dedication to a cause greater than oneself or as the by-product of one’s surrender to a person other than oneself. Happiness must happen, and the same holds for success; you have to let it happen by not caring about it. In other words, teach to the test and the students forget what they crammed after the test is over or teach by emphasizing meaning, students will be able to perform on a test.The test score is the by-product of having learned well and not the meaningless hurdle to jump over at the end of the race. It broke my heart to hear that my son’s fourth grade teacher gave a practice test every day to prepare them for the standardized test to come at the end of the school year. If it were me, that would have turned me away from school and away from learning. The teacher told the class that her reputation was on the line and her reputation was tied to the test scores. Needless to say, fourth grade became something to get through and get beyond. For this invention will produce forgetfulness in the minds of those who earn to use it, because they will not practice their memory. Their trust in writing, produced by external characters which are no part of themselves, will discourage the use of their own memory within them.You have invented an elixir not of memory, but of reminding; and you offer your pupils the appearance of wisdom, not true wisdom, for they will read many things without instruction and therefore seem to know many things, when they are for the most part ignorant and hard to get along with, since they are not wise, but only appear wise. Socrates was most concerned with the learners’ soul. Just last week I met with two grammar school teachers to talk about a little girl who is like a daughter to me. The teachers explained that within the current environment of school, the children are encouraged to merely scan nonfictional texts to seek out relevant information. As I listened, I thought: how (and why) do we teach her how to engage in such a soulless, meaningless task so that she can perform well on the standardized test? I received an education in a subject that most would now call antiquated–rhetoric. We no longer teach rhetoric even though it was once the foundation for all study. Before I returned to graduate school for a Ph.D., I was an assistant vice president at Chase. I had no preparation for business. I had a foundation in learning how to learn. If we do not know what the marketplace is to look like in the future, it seems that the most responsible thing to do for our kids is to engage them in the education process, model what it means to think, and learn how to learn. Then, no matter what the future holds, they will be able to adapt and move forward. Instead, we choose to constantly be in reaction to what the workplace demands school to be. This mentality will always put us behind because by the time we have answered those demands, the demands will change. This film is just another example of an educational system rushing to catch up. The film creates the argument that the old, post-industrial school model is out-of-date and needs to be replaced with a high-tech model of school. Same wine, different bottle. Viktor E. Frankl, Man’s Search for Meaning (New York: Simon & Schuster, 1959) 16-17. Plato, Phaedrus (New York: Penguin Classics, 2005) 274c-275b. 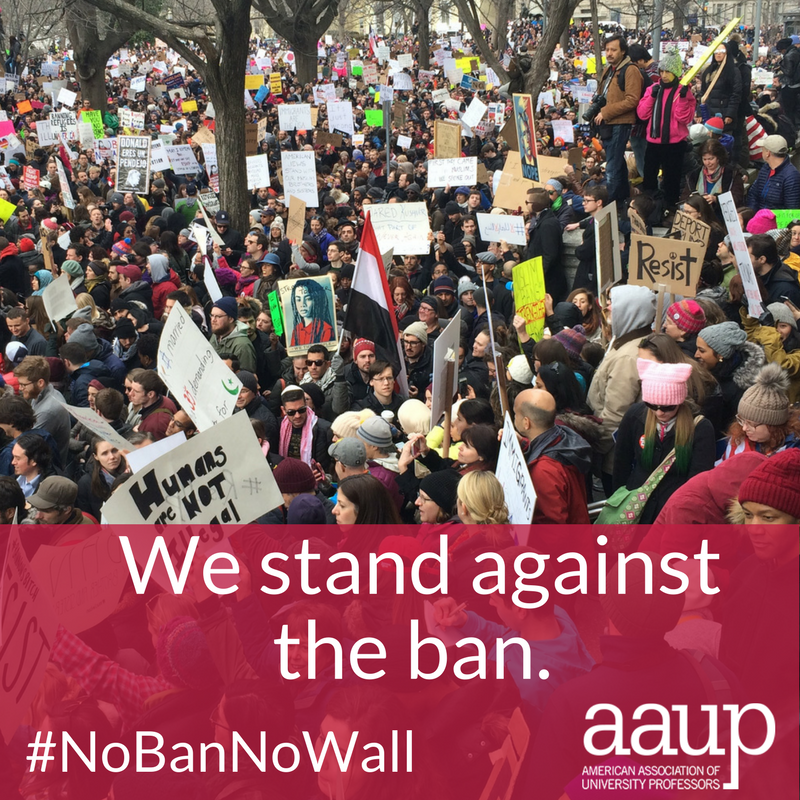 NCC/AAUP invites you to consider supporting a petition, brought to our attention by Professor Miguel Alonso, calling on President Obama to issue a presidential pardon to individuals covered by Deferred Action for Childhood Arrivals (DACA). DACA, a program begun by the Obama Administration in June 2012 after the failure of the Dream Act, allows undocumented immigrants who arrived in the United States as children to apply for a two-year deferment from possible deportation proceedings, subject to renewal, if they meet certain criteria. The applications of close to 750,000 individuals were approved. The recent election of Donald Trump leaves the future of DACA and the undocumented individuals who have benefited from it in doubt. Trump’s appointment of Steve Bannon as his senior advisor and Kris Kobach (Kansas Secretary of State) as a member of his transition team brings determined anti-immigrant fervor and expertise to the emerging administration. For an excellent overview of what Trump means for Dreamers, please consider reading this summary from The New Yorker. In April of this year, the NCC/AAUP’s Annual Symposium featured extraordinary stories narrated by a panel of Dreamer activists—they were community college students like our own Angel Reyes who found his life transformed by professors at NCC. The American Dream was unfolding for Angel under the tutelage of his mentors at our College. Support for Dreamers like Angel is also a central goal in the platform of the NCC/AAUP’s Let Us Learn/Let Them Learn campaign. For those of us in higher education who may be wondering what a Trump presidency entails for higher education, this week’s Weekly Read offers a survey of recent reflections on exactly this question. Sara Goldrick-Rab, a professor of Higher Education Policy at Temple University provides a short-list of higher education policies she expects to see emerge from the Trump administration. Noting her extensive experience, as a professor at the University of Wisconsin, with the Scott Walker governorship in that state (a politician whom she describes as Trump’s nearest peer), Goldrick-Rab highlights three policy changes she expects to see: 1. Promotion of for-profit colleges and universities and a continuing defunding of public education. Trump has experience in for-profit education: Trump University. 2. College loan origination will return to private banks and underwriting will be introduced, meaning only worthy applicants will get loans. Enrollment will drop because fewer people will qualify for loans for tuition that won’t decline. 3. The Department of Education will be downsized (because big government is bad), and vulnerable populations will have fewer protections. Writing in the Washington Post, Danielle Douglas-Gabriel adds some detail to Goldrick-Rab’s points, putting them in the context of President Obama’s higher education reforms. One reform the Obama administration and the Department of Education put in place was the gainful employment rule that placed regulations on for-profit colleges. These rules made for-profit colleges more accountable for earnings and loan debt of their graduates. A Trump administration might kill this law. Debt burdened students would be hurt the most by this roll-back. Since Trump’s campaign was policy-light, it’s hard to know what he will enact. If he aligns with Republican priorities, we can expect to see student loans turned over to private institutions. Think-Progress takes a look at Trump’s deregulation and loan plans. In an October speech in Ohio, Trump proposed an income-driven repayment plan that would “cap loan repayments at 12.5 percent of a borrower’s income and then forgive the loans after 15 years.” This sounds good, until you consider another Trump campaign promise, to sharply reduce the size and authority of the Department of Education and the Republican Party’s goal to get the federal government out of the loan business. If both were to come true, the government would be responsible for paying banks hundreds of billions of dollars of unpaid debts after the 15-year loan forgiveness kicked in—a boon for Wall Street. Moreover, if privatized, student loan rates on the private market would rise from the current 4.75% rate to something more like 9.5 to 19%. Low-credit score borrowers could see lifetime repayments rising $7,340 to $24,470. Low-income students, meanwhile, would be considered bad-credit risks: they simply won’t go to college. An issue raised by Inside Higher Ed was Trump’s call for “extreme vetting,” a process that would put in place an ideological test for anyone wishing to enter the United States, while suspending visas for anyone coming from countries “that have a history of exporting terrorism.” People in international higher education have said such policies would make it extremely difficult for students from Muslim countries to attend American colleges and universities and that they might go to friendlier nations like Canada or Australia for their education. Finally, the name Ben Carson, has been floated as Trump’s possible selection for Secretary of Education. This is from the New Republic: “Brace yourselves for Education Secretary Ben Carson. Carson, who believes God created the world in seven days and that the Egyptians built the pyramids to store grain, is reportedly Trump’s top pick for the job.” Carson denies the scientific validity of evolution and climate change. That’s the summary. Make of it what you will. The End of Academic Freedom? Rectenwald’s fate—whether he is out of a job or just temporarily on leave while his “mental health” issues are resolved—is uncertain. What is certain is the fragile state of academic freedom itself. Let’s recall what academic freedom means. Briefly put, academic freedom is “the freedom of scholars to pursue the truth in a manner consistent with professional standards of inquiry.” The pursuit of truth, a bedrock value of academic freedom, is generally taken to be hugely beneficial to a democracy and a necessary condition for a full expression of human nature. For scholars in public institutions, academic freedom is also a First Amendment right. A crucial condition of academic freedom is tenure: tenure ensures a scholar may pursue truth—if pursued with academic integrity–without fear of losing a job. Different forces seem to be rendering academic freedom obsolete—or, at the very least, diminishing its presence and undermining its integrity. One force, the conversion of most colleges to a business model of governance, means casual labor does most academic work: for scholars hired on a contingent basis, academic freedom is a dream and pursuing the truth or “following the argument where it leads” (as Socrates puts it) is perhaps not worth the risk of losing a job. With the bulk of academic work being plied by academics who can be fired almost at will, truth is a victim of institutional or administrative priorities—whether these be compliance with Title IX or the need to cater to local business interests by hijacking curricula and turning colleges into training sites. Whether you agree or not with Professor Michael Rectenwald’s views, you should wonder whether his untenured status at NYU made him vulnerable to being taken out of the classroom. The end (i.e. the goal) of academic freedom: the right to pursue the truth, without fear of reprisal, without fear of giving offense, without fear of causing discomfort. In this election cycle, where lying is a form of political currency and a sign of authenticity, nothing is more vital. Just as we hoped that Nassau Community College was firmly on the path to restoration and renewal, our Board of Trustees has proposed new Policies 1200 and 1300, which we believe violate the NYS statutes and regulations governing the Board’s duties and responsibilities. It also contravenes its “historically accepted” role as enunciated in 1966 in the joint “Statement on Government of Colleges and Universities” issued by the American Association of University Professor (AAUP), American Council on Education (ACE), and the Association of Governing Boards of Universities and Colleges (AGB). In fact, these standards appear to have guided the formulation of the pertinent NYS statutes and regulations. Policies 1200 and 1300, if implemented, will upend what President Keen refers to as the recognized “realms of responsibility” among the Board, president, administration and faculty. We are concerned that these new policies will jeopardize our Middle States accreditation. In the April 16, 2016 “Report to the Trustees, Administration, Faculty, and Students of NCC by An Evaluating Team Representing the Middles States Commission on Higher Education” (hereinafter: “MSCHE Statement”) the Commission found the college out of compliance with Standard 4. That standard requires that all constituents’ responsibilities and duties be clearly delineated. As noted in the MSCHE Statement, “There is no evidence that the Board of Trustees has an organized way of ensuring the effective interaction of the governing bodies in a manner consistent with the principles of shared governance.” The report further noted that, “The institution must create a system of shared governance in which each major constituency carries out its role in a complementary manner consistent with the principles of shared governance and New York State Regulations.” (MSCHE Statement, p.10) Policies 1200 and 1300 fail to meet this standard. The message is clear: it is not only the faculty and the administration that must work to address the Middle States deficiencies but also the Board of Trustees. If these policies are adopted, we believe that the Board will continue to place our accreditation in jeopardy. We urge the Nassau Community College Board of Trustees to modify Policies 1200 and 1300 so that these policies are consistent with NYS statutes and regulations and Middle States standards.